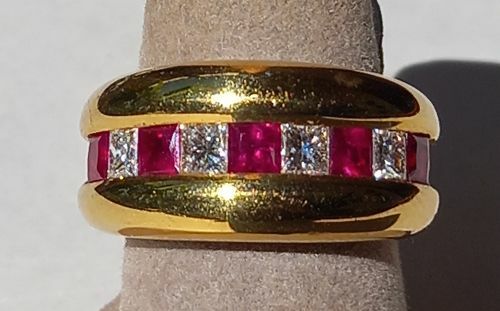 Important & rare Burmese Ruby Ring @ 2.42 ct. set with 8 baguette diamonds @ 1.11 ct. total weight, heavy 18K Yellow Gold, unique fuchsia-magenta-shocking pink color, excellent light refraction, sensational color! New. Solid wide band 18K gold ring (17.85 gr.) 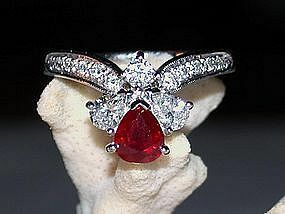 set with 5 top quality Princess-cut Burmese Rubies @ 1.35 ct., (3.5 mm. each) and 4 princess cut Diamonds @ 0.79 ct. total weight, spectacular! New. Important Solid 18K. 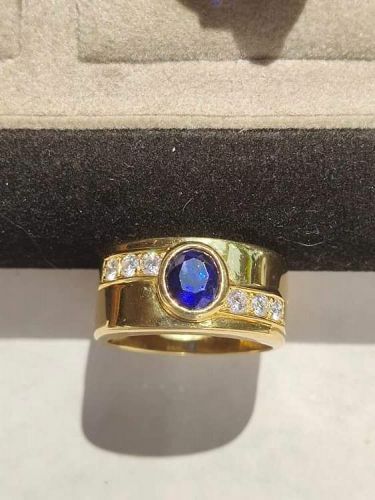 Gold Ring set with one Genuine Ceylon Cornflower Blue Sapphire @ 1.98 ct., one Golden-Yellow Ceylon Sapphire @ 1.09 ct., 2 Pear shaped Diamonds @ 0.54 ct. total weight, 20 Tapered Diamonds @ 1.09 ct. and 14 Brilliant cut Diamonds @ 0.18 ct. total weight. One-of-a-kind and superb! 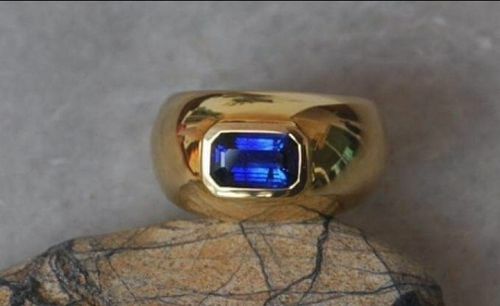 Ceylon Octagonal Blue Sapphire Ring, 18K. 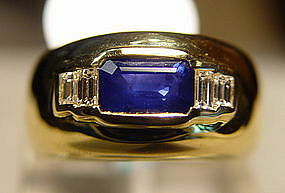 Exceptionally Fine Emerald-Cut (octagonal) genuine Ceylon BLUE SAPPHIRE @ 2.05 ct., 18K. Yellow Gold, suitable for Men as well as Women. Stunning! 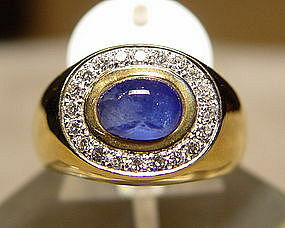 Large and Fine Oval Blue Ceylon Sapphire Ring, 18K. 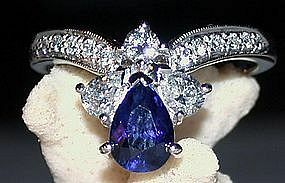 Large 4.26 carat genuine Ceylon BLUE SAPPHIRE set with 12.9 gr. 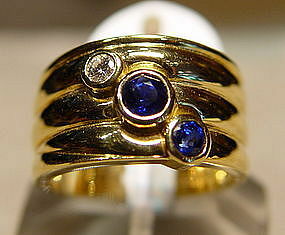 Yellow and White Gold 18K. 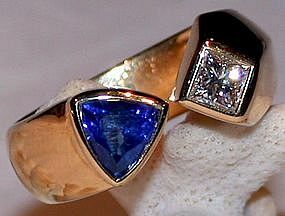 Cabochon Blue Sapphire/Diamond Ring 18K. Sky Blue genuine Cabochon Sapphire @ 2.68ct with 20 brilliants @ 0.34 ct. total weight, 18K. Yellow Gold. New. 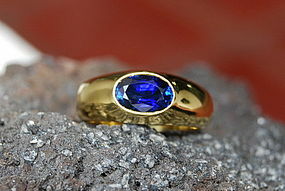 Large Ceylon Cornflower Blue Sapphire Ring 18K. 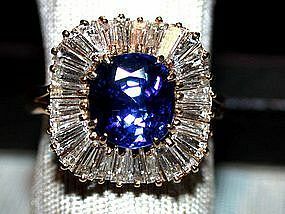 Stunning large Ceylon Cornflower BLUE SAPPHIRE Ring @ 2.08ct., 18K. Yellow Gold (7 grammes). 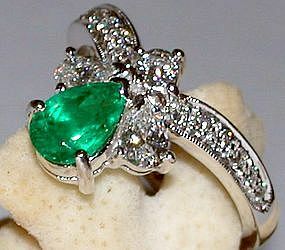 All our stones are genuine and come with a guarantee. New. 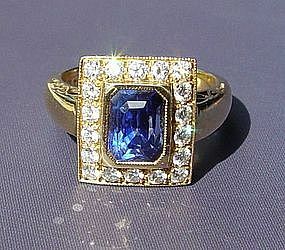 Ceylon Blue Sapphire Ring @ 1.27ct and 6 Diamonds @ 0.39ct total weight, 18K. Yellow Gold. 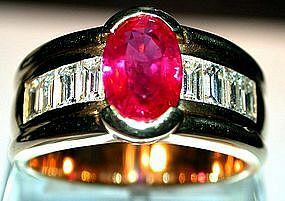 All our stones are genuine and guaranteed. New. 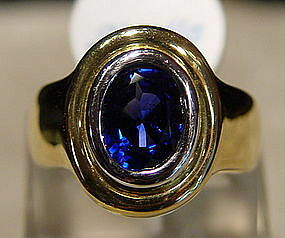 Ceylon Blue Sapphire Ring with 4 Diamonds 18K. 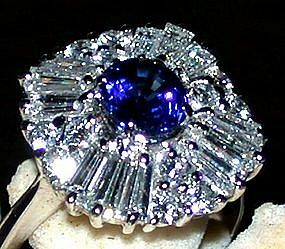 Stunning Octagonal Blue Ceylon Sapphire Ring @ 1.48ct. with 4 diamonds @ 0.25 total weight, 18K. Gold. Suitable for Men as well as Women. All our gems are genuine and come with a guarantee. New. 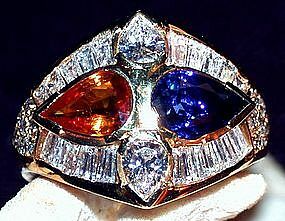 Modern Ring set wit 2 genuine blue sapphires @ 0.67 total weight as well as 1 genuine diamond @ 0.007, 18K. Yellow Gold, wide band, new.